Q2. What is the correct management? Also known by the less precise term paroxysmal supraventricular tachycardia (PSVT), AVNRT is characterized by a regular narrow-complex rhythm and a ventricular rate of 160 beats/min or greater. It is the most common nonsinus tachydysrhythmia in young adults. 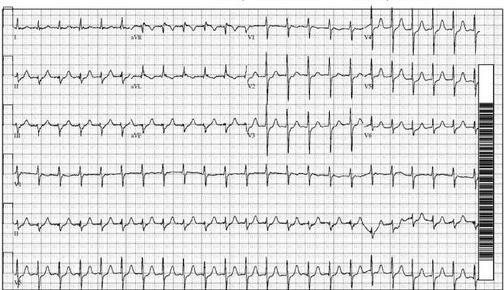 As its name suggests, AVNRT occurs as the result of a reentry circuit within the AV node, with normal conduction (narrow QRS) down the bundles of His, and with retrograde conduction (inverted P waves typically buried within the QRS) up into the atria. The onset of AVNRT is typically abrupt and frequently arises in the context of strenuous exercise or emotional stress. Termination is also abrupt, either spontaneously or following vagal maneuvers that patients are taught or just adopt instinctively. Most patients with AVNRT are symptomatic, but hemodynamic instability is unusual in the absence of underlying cardiopulmonary disease. If vagal maneuvers fail to restore sinus rhythm, first-line field or ED therapy for AVNRT is adenosine (6 mg rapid large-bore intravenous bolus followed by a flush; repeat with 12 mg if no effect on rate). This approach is successful in 85 to 90% of cases. In refractory cases, diltiazem, esmolol, or metoprolol may be used. Rarely, synchronized cardioversion (at 100-200 J, synchronized and biphasic preferred) is required to terminate AVNRT that is refractory to pharmacologic therapy or in a patient with hemodynamic instability. Most patients can be discharged once AVNRT has been terminated with adenosine or vagal maneuvers. Patients with frequent recurrences are candidates for prophylaxis (typically with a beta-blocker or calcium channel blocker) or ablation therapy.